There's nothing nobler than saving lives...except for hamburgers! 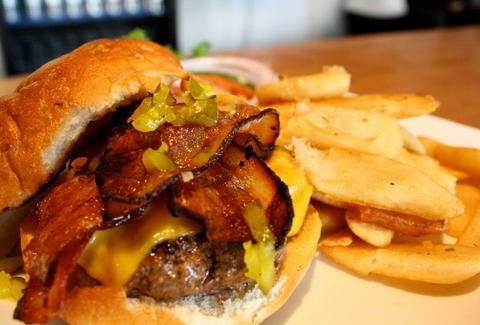 For a joint run by an expert at both, head to Mission Beach Burger Company. MBBC's driving force is a former Navy medic who finished his service in '06, then, while resto-working through UCSD, fell so deeply in love with the industry he decided to open a small place of his own, with an 8-seat custom bamboo bar and a patio boasting a glorious view of hot, practically naked women the Belmont Park Rollercoaster. All under $10, USDA choice sirloin burgers (ground in-house daily) come in variations from the diced bell pepper-infused "California" (topped w/ poblanos, guac, jack) to a Jim Beam-soaked-bread-crumb'd patty topped with smoked bacon, cheddar, and BBQ sauce called the "Kentucky" (plans to name it the "Calipari" were scrapped due to fears the burger would bolt, leaving a mountain of health-code violations in its wake). Even more adventurous is the feta-stuffed/kalamata-mixed "Greek" on a ciabatta bun, plus there are beef-substitutes like the "League" (patty = wasabi-aioli/lemon-juiced calamari steak), and an organic falafel number served with dill yogurt and dubbed the "Fairfax", probably in honor of Fairfax's 72% Arabic population...oops, that's supposed to say "white". To cool you down, the bar's got six taps (bottles and vino coming soon), and plans in the works to match seasonals with special edition burgers, pairings that'll keep you in your seat and out of the great white ocean -- so these burgers actually can save lives!